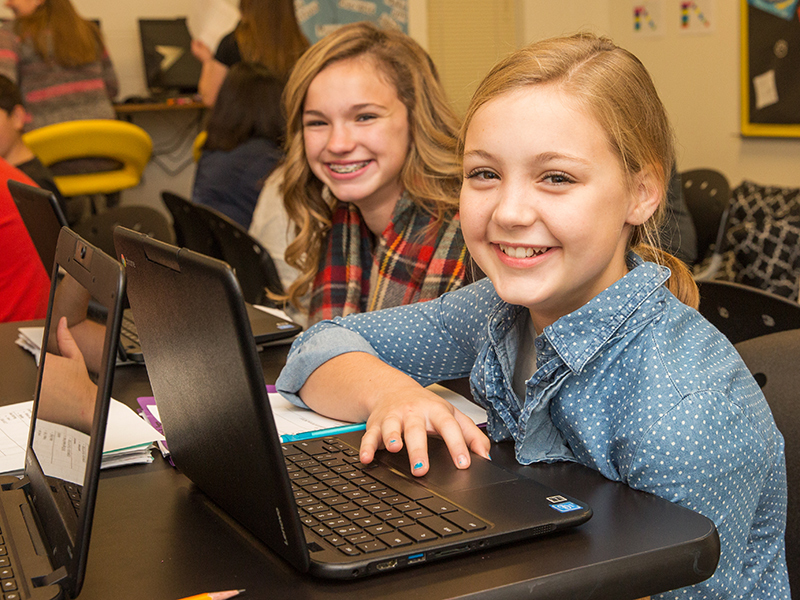 Students at Cisco Junior High School work through weekly learning playlists, designed by teachers to align structured learning opportunities to a learning goal. Students are able to choose from the activities each day, monitoring their progress and making informed decisions to ensure they complete the required activities, with the option to work on extension activities. Within the classroom rotations, students can select from independent practice, small group instruction with the teacher, group work, math games, and online instruction. Small group instruction is one of the teachers’ key levers for supporting students. Teachers often utilize the time to review student data, set goals, support struggling students, and teach, reteach, or remediate instruction. Though students self-select into activities like small group instruction, teachers will often suggest or request particular students to participate, utilizing data points to target supports based on student needs. Selects learning activity, including small group instruction. Monitors progress on weekly playlist. Leads small group instruction based on student needs. Circulates to support students working on other learning activities. Supports student learning through online software.